Beautiful! 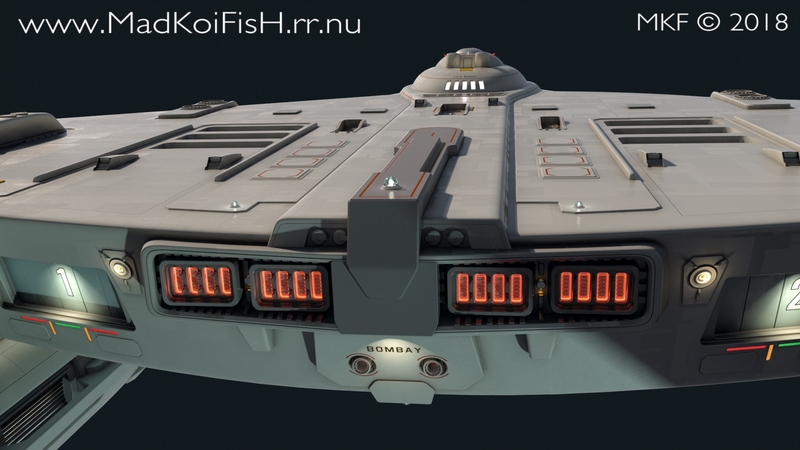 I love the subtle metallic texture of the hull. Fooling around with bits here and there. Gotta redo those torp markings heh. Thinking those scoop things I stole off the destroyer need rework too as they just do not fit scale wise, the thin walls just do not match up. Ok duffed about with those sipe things (sensor blisters?) 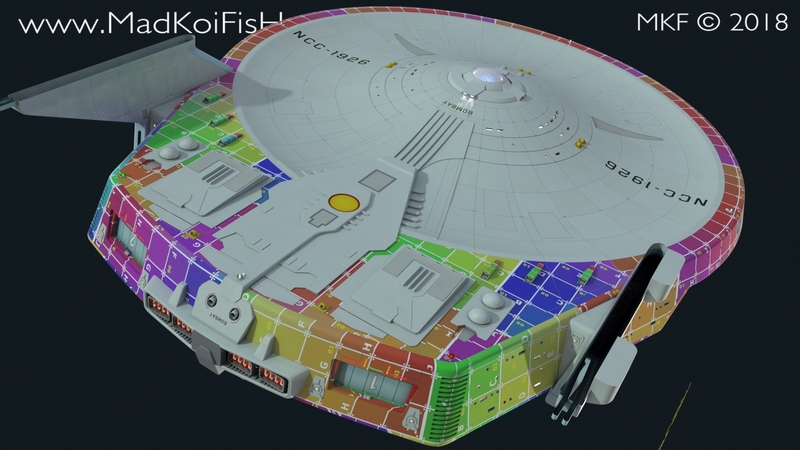 Detached and added unique mapping for each panel on the upper saucer. and extruded in the grids on the flat area of the topside. 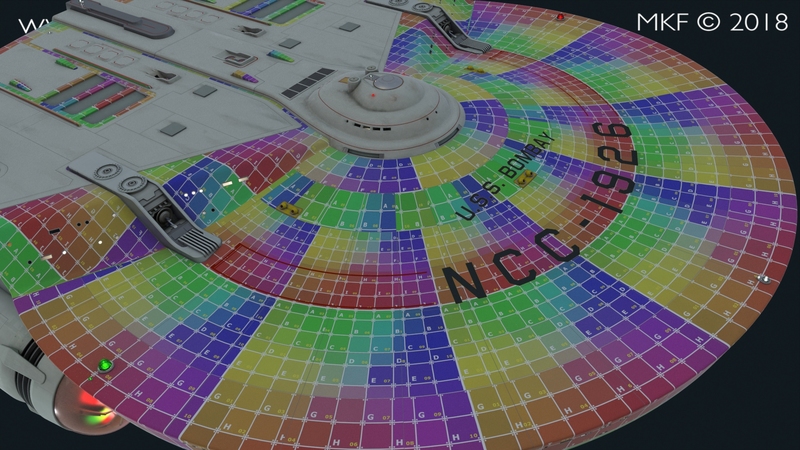 I think it shows off the grids more without the odd there and not there appearance of just cut grids due to the material defining them Here it is just all hull color and geo creating the darkness. 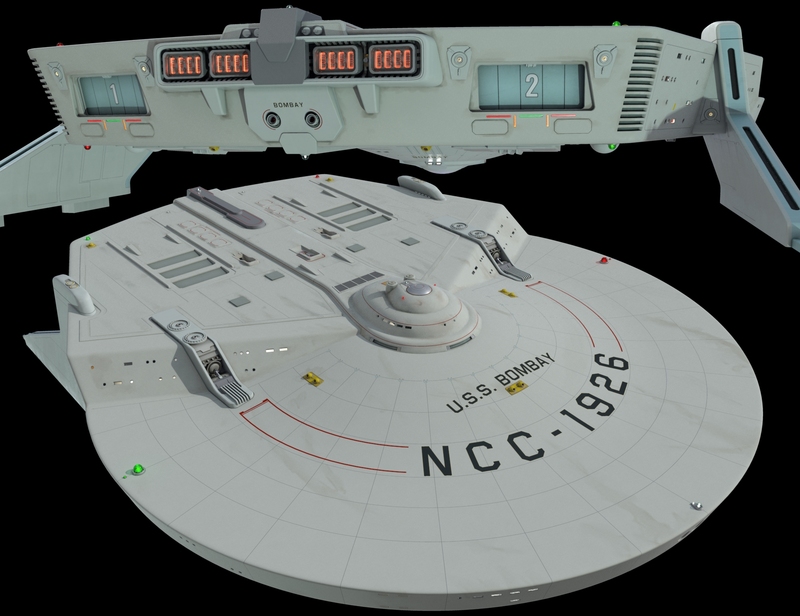 Likely all the work on the saucer might be undone as I am really considering UVW unwrapping the mesh for custom diffuse maps. 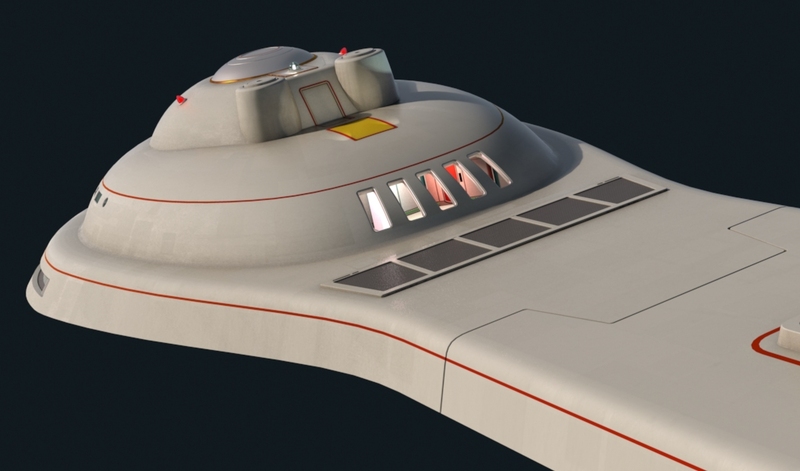 Also considering detaching and extruding up the red lines on the saucer so they look painted on. ATM they are just cut into the surface. 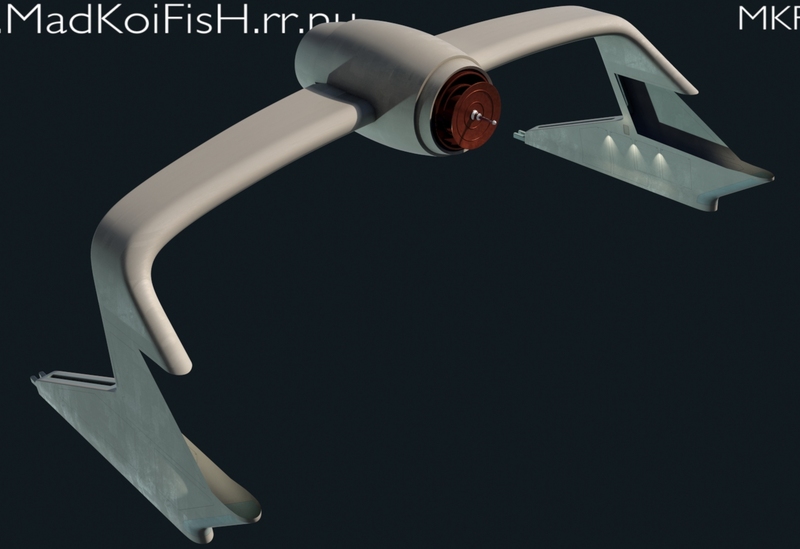 Now I said I wasnt going to do a rollbar but I thought that is the Buenos is doing spy stuff maybe it needs some sort of sensor cluster for snooping about. I did build struts and things to allow such thing to be clipped on. And so here is a slightly shrunk connie dish on a beer keg. I dunno what will go on there but I figured it might add some variability. I think the ship looks better without the rollbar. If it is applied it would only be on the one ship. 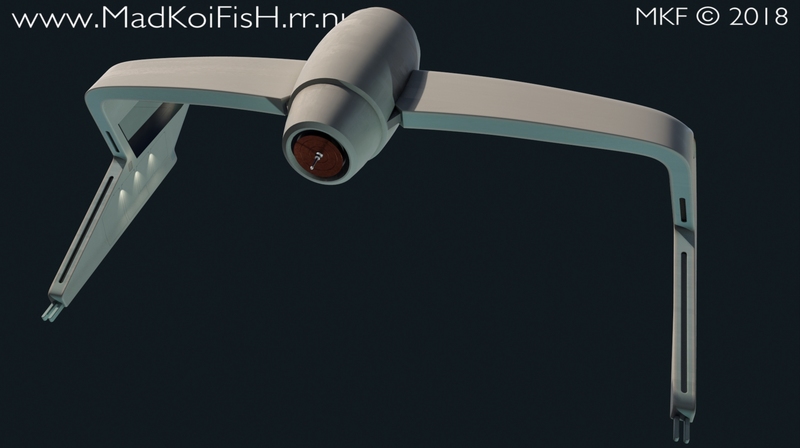 Still working the shape into the strut area given. 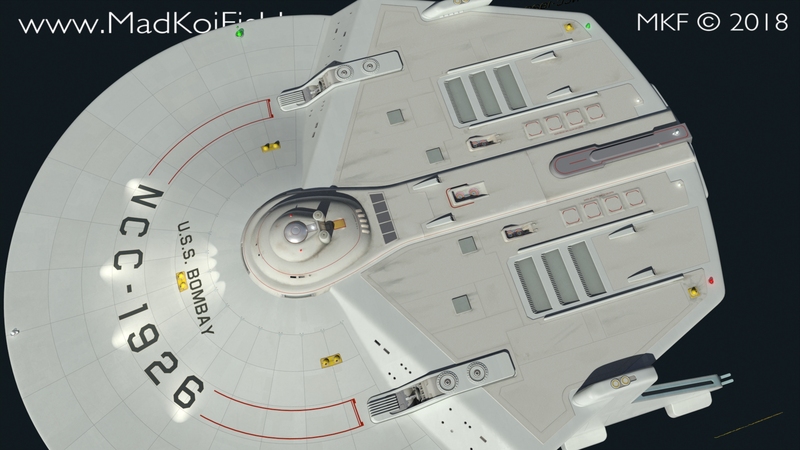 What I am a bit stuck on is how a sensor package would appear on a TOS ship heh. Doubt it would be a pair of dishes but who knows. I just feel it would be a miss to not at least model one optional attachment for those struts. 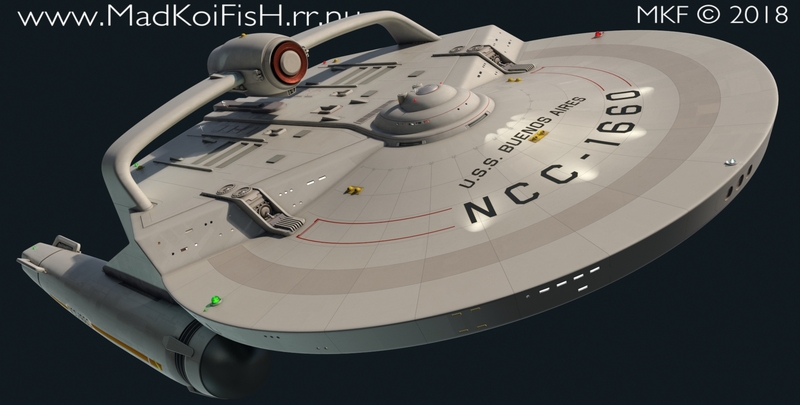 Maybe some spinny dish things like a AWACS on it. 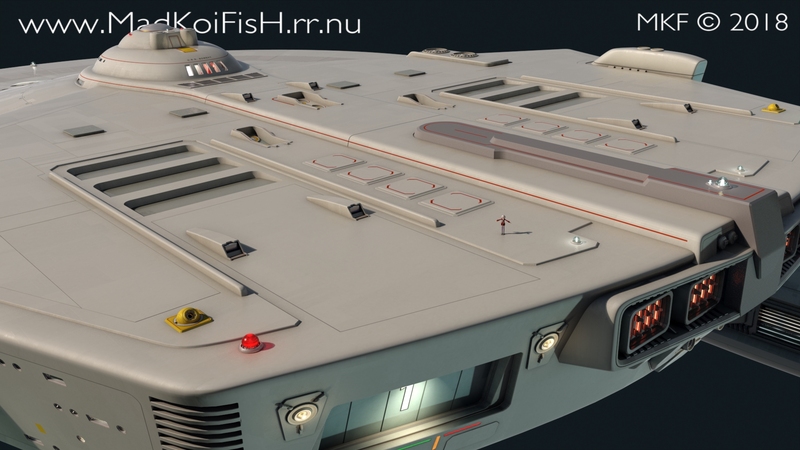 So just a bit of a aft render of it on the ship and some alterations to the bar. A bit cheesed off as somehow the seam polies got wiped when I was extruding things out. Need to figure out where it went or reproduce it again sheesh. Oh and this bar can JUST fit a turbo lift, now it will have to do grav plating tricks as in it will travel like those old bank airtubes and go sideways to avoid any janky rotating in shaft stuff. Then when it gets to the Keg, itll rotate to vertical. Though with grav plating I could see it be cool to have the floor go around the KEG so you just walk around the machine bits inside and access them as section-able things or pull out units. Also looking at my other TOS stuff I did go a bit over conservative with things. It is more classic TOS than any sort of revision/update. I feel I let the model down some in this regard. Sticking with a dish for a bit so instead of the old spiked dish I thought maybe a covered dish as a inbetween to the TMP style. Kinda avoiding all the xmas tree looking crap like the connie on STD. Also added some hard points so you could imagine this being craned over by clamping onto the keg. That rollbar looks really good, kinda has a 50's feel to it being so curvy. However if you want to go without it, maybe some 'spikes' like the USS Bozeman had could work, as those were supposed to be extra sensor equipment. Some renders of me still working the keg shape. Adding other details and sensor like things. 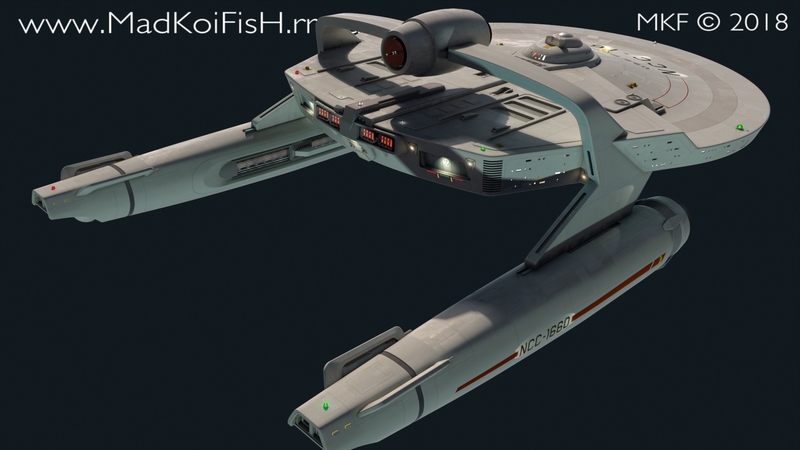 I should shrink things a bit, the deflector clears but orthos make it look a bit odd. FIVE STARS the dish-pod. I LOVE IT. Most of it is collapsed now so details will be going in. Rarg always once I click render I think of something I coulda done just before to add to the objects. heh. I'm not sure about the beer keg, but I really like the way the rest of the rollbar looks. Spent most of the day outlining the use of this mesh and planning future work as well as checking to make sure stuff mentioned actually aligns to the real world of the object. I have realigned my deck chart from the 8/6ft deck heights to a 10ft one for the 3meter avg height and got in 18 decks. Of course these wont align to everything as nothing like this is such a simple building style height. Think of those 70s split level houses that were so popular where you had rooms 2 or 3 stories tall some split in half as sunken pits or changes in elevation say a hallway in which you step down into the rooms and the like. I think averaging like this works out in the end as many split decks would just ge5t denoted as the next deck. 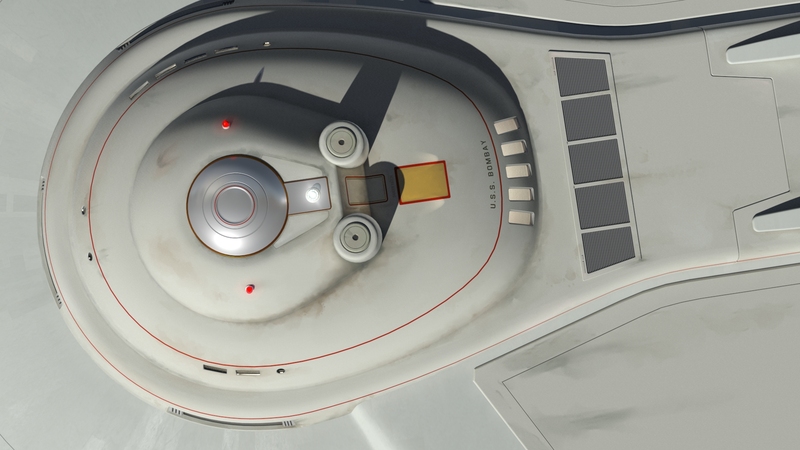 As for numbers to letters I dunno as trek mixes them up WAY too much. Numerated seems more sensible as you do not have to think how many decks down or up your are from a location. Letters well, heh, worse if your not eng or even human. Either way I needed at least a deck 8 through 12 to tear open. Granted these wont be a single hole as there is no real singular section I could get that range from. 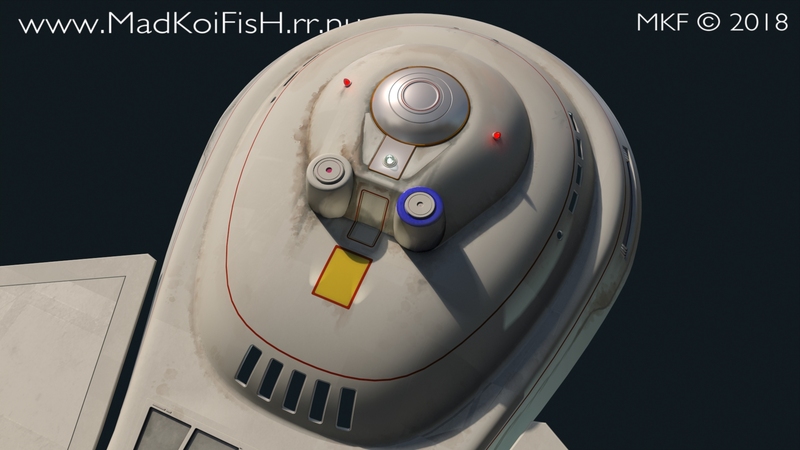 As for mapping damage and planned work I have yet to decide if I will paintover to denote what will be done or if I will just go for it and do such onto the ship directly. I do think i should look at uvw unwraping her though as painted burns would be SOO much easier to do. I cannot decide if I want to keep that fin thing on the bottom of the keg or not. UGGGHH thought I would have a start on the UVW unwrap but NOOOO it took me all this time just to merge up the bits to rep for it. So tomorrow is when all the headaches start. Anyhow hopefully I planned things right and it all goes ok and will be fairly easy to set up. Idea is to spread it all across 5 maps. Again these will be like the tos connie ones I did HUGE heh. One thing that probably wont happen is a 1to 1 scale on the parts as if I remember max defaults by screwing that up. It I guess will all depend on how it works out as it has been a while since I did this crap. UGGGHHH hate uvw unwrap. May appear a bit heavy handed and strange atm but it is mostly placing crap and making sure things look ok. Again loads of back and forth as what I think works as a unwrap does not. That and goofs in the mesh prior to but if I edit it the entire unwwrap is lost even if I save the data if I weld or delete faces to simplify things it borks the entire lot. UGH. One example are those turbo lift caps. I forgot to delete the face underneath them and that has been a rage point. Also I forgot to weld the damned B deck blister down so I wont be able to do that at all until I collapse the unwrap which I dislike doing but welp there you go. I so hate UVW unwrap. HAH. I guess I have to do the whole lame distortion thing to my gloss and aniso maps vs the whole squashed sphere trick to create a repeating circular pattern from a rectangular map. Not all that sure how dirty or clean I want to make this either. I do plan to try to set up a faster render rig to cut down on these 45min renders. The 9k maps likely wont help at all. Toned a lot of it down and added a pure white WIP light. I will likely start moving to just the GI light as even 14min renders are a huge sigh. For now I am moving to the rest of the unwrapping before I go further on the textures. 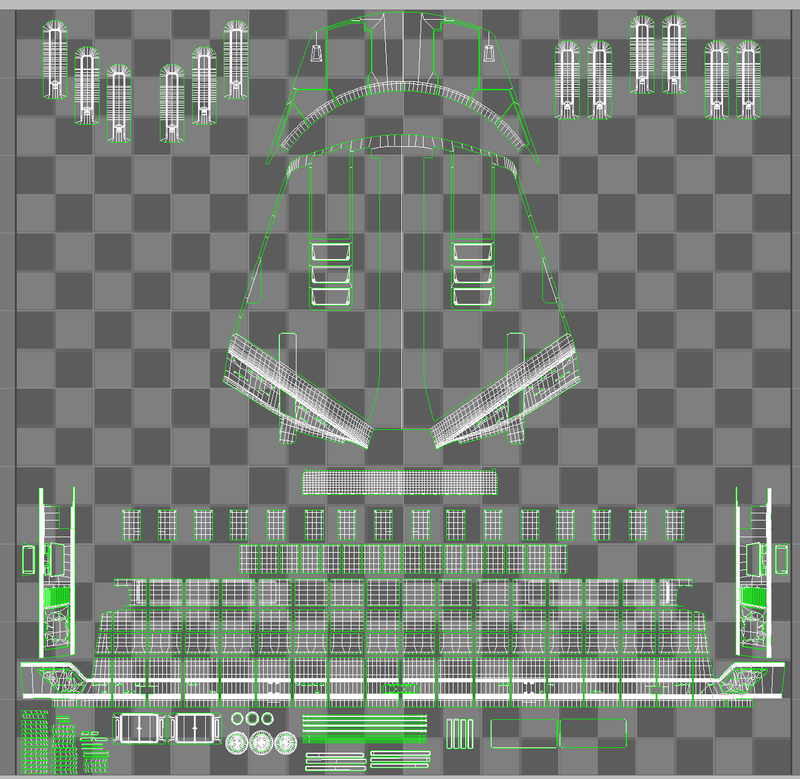 Large part I think will be placing the surfacing stuff vs any diffuse which atm is all I have done. Some of my worry about the overdone dirt feel vanishes off in distance renders so I might not get to fussy. 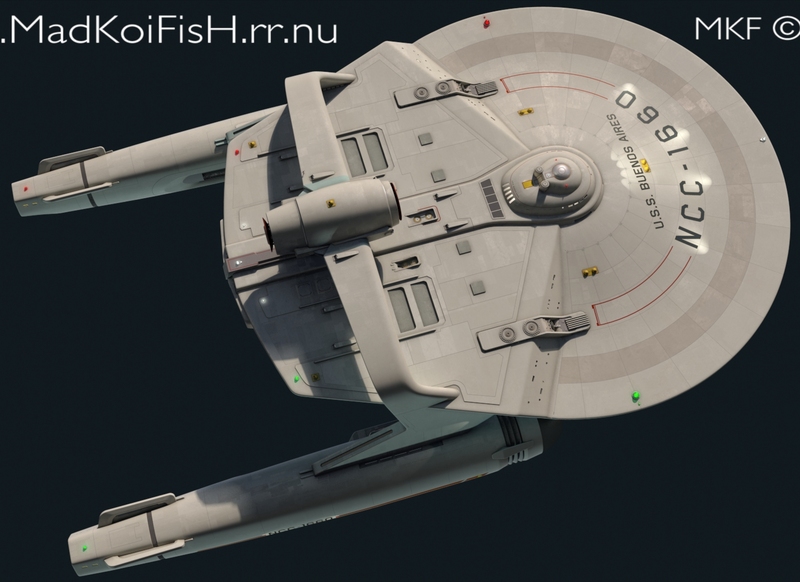 Mostly it is a argument with replicating what I did for the tos connie or do something else. 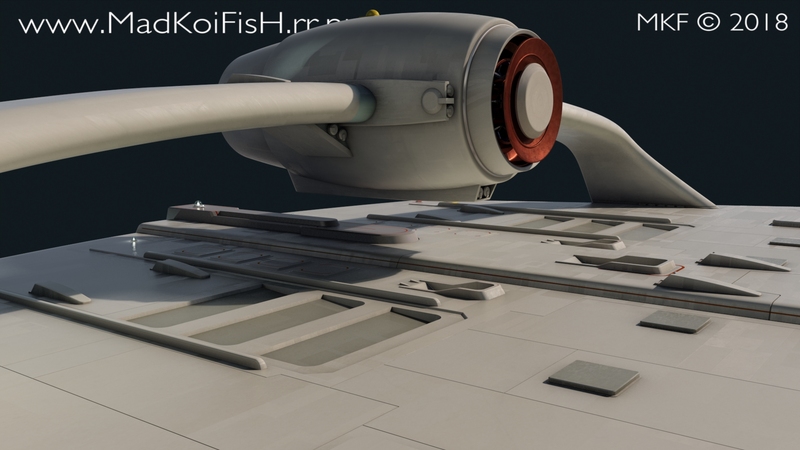 Anyhow on to the hard part which is that damned central hull as the bits of it wrap all around the ship. Heck I really wanted to flatten the bridge more than I had as much of that unwrap was just projected planar snaps. The only things I really squashed were the turbo shafts and those were a bodgery in the extreme as max just did not want to do what I wanted so it was loop zoom loop zoom and hope I match the zoom on each loop as the stupid software would only zoop from centers of selections so if I looped both tubes and zoomed or enlarged it would do it from thew center of the entire group! not from each loops center like what I could do in the editor with the polygons. Oh well. . . . . uvw sux. Hell maybe I am doing it wrong but I refuse to use any of the walk tools as those will break an object into hundreds of bits that are just a nightmare of seams everywhere. AHYNOW like any of that matters here is where I stopped on the uvws for now. 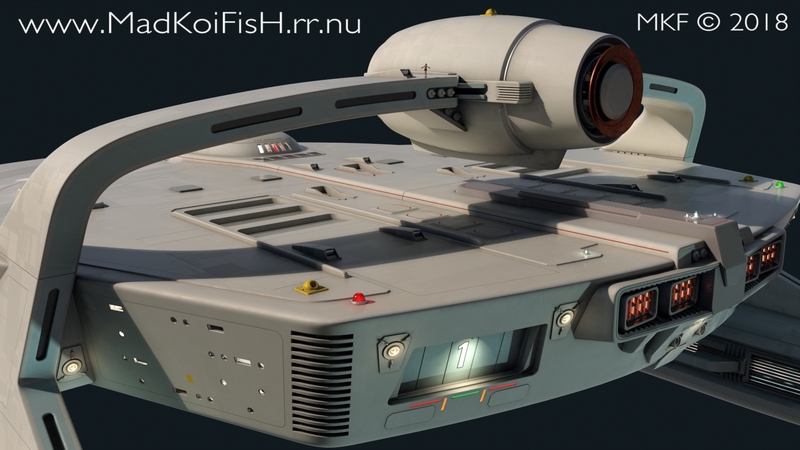 (note the tonal change in the hull as my WIP lighting was super warm for some odd reason. Likely a leftover of when I was attempting to use photometrics or some other type of lighting. Sadly none of those worked as they are all not meant for global lighting IE large environs or space etc. OHHH man massive ulcers, I have to flatten squish align and position each edge in alignment. BLEAHHHHh and even then there is sometimes slight distortions as windows just make all the tools vomit everywhere! so about what 30min per section of saucer. . . . . . I know I flew through and bodged some bits on the connie, mostly as they had much easier to break up shapes. This thing though a lot of oops as I just dislike having seams say on the saucer rim. I imagine those as rounded objects with the seams further down off the curvature as to avoid weakness. Anyhow Paying for it NOW lol. 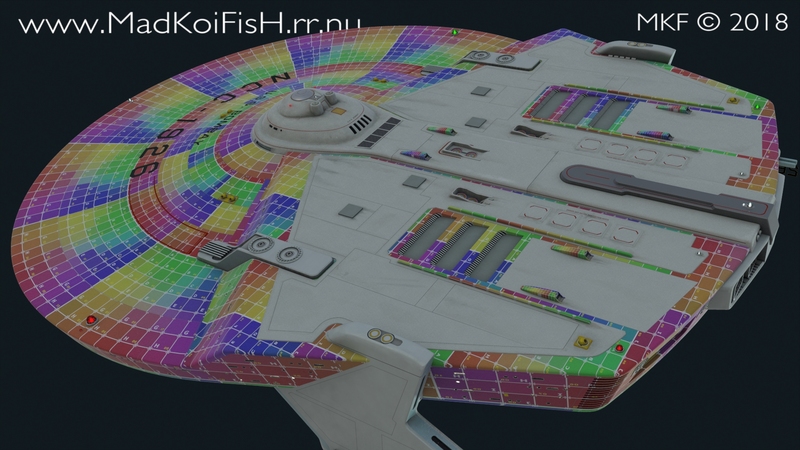 One thing I am debating is if I should map the panels on the saucer body itself as squares and let the mapping distort the patterns IE the shrinking of the pattern along the hull You can see this in the above image as the auto map flattened and squared up these parts. They are just messily arranged all over and of various sizes. Id clearly have to rearrange them and scale them properly. The other thing is alignments, getting the upper tiles to match to the rim etc as I want to try to keep seams near each other so painted details will line up vs the whole bull$hit of painting it to align across disjointed sections. All bloody night and this is all I have. Most of that rim is finished the saucer top is roughly laid out but needs alignment and straightening of the edges. I dunno how I will automate that yet as it needs it. The only issue is I have not been able to select single panels and redo the "flattening" and get it to somewhat resemble what was automatically done. I also seem unable to use the same process I used on the rim mapping as it just stretches bit faces all over and makes a piled up folded up mess. Go fig. . . . . . Trying a new pattern for the mapping it is helping me tell what is upside down inside out and pointing the wrong way. 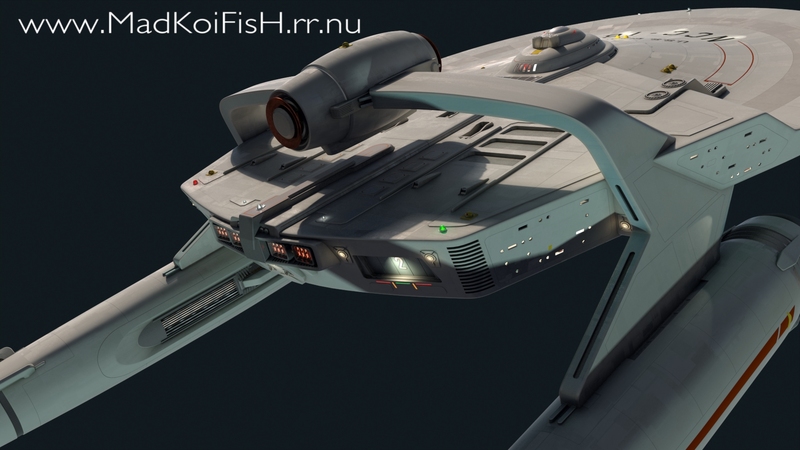 You will notice some of the inner saucer panels that are like this. Plan is that they will all match the rim panels. And maybe will flow all the way in from them as well. The big argument is that maybe I shouldnt allow them to taper off IE the letters you see get smaller as the panels go inward to the bridge. It isnt much but if I say wanted a textured detail further in and along the outside it would not be the same size. This is something irksome as I am having to match thing by eye as max just choose whatever and makes it all fit a square disregarding any aspect ratio so I have to eye ball it constantly. I have yet to find any setting or toggle for this. Actually the tool for all of this is dodgy a lot of click and hold multi level tools but not written in a way that while in full screen you can even SEE the options! Clearly they expect you to fuddle around in it as a windowed object over max itself. It is like NO I am not spending more time clicking through windows heh. At time when doing this I want more than what I have for displays. Least 3 2k units or a pair of 4k ones lol. Also wish like mad I could customize this stupid UI too, tools are all over the damned place and just a lousy workflow. 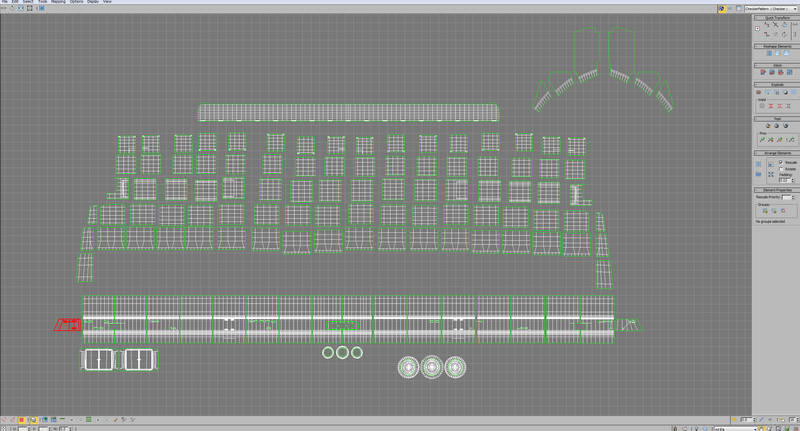 Oh stupid thing needs a align selected to X edge or arrange evenly paced by X. Anyhow a fruity hull. 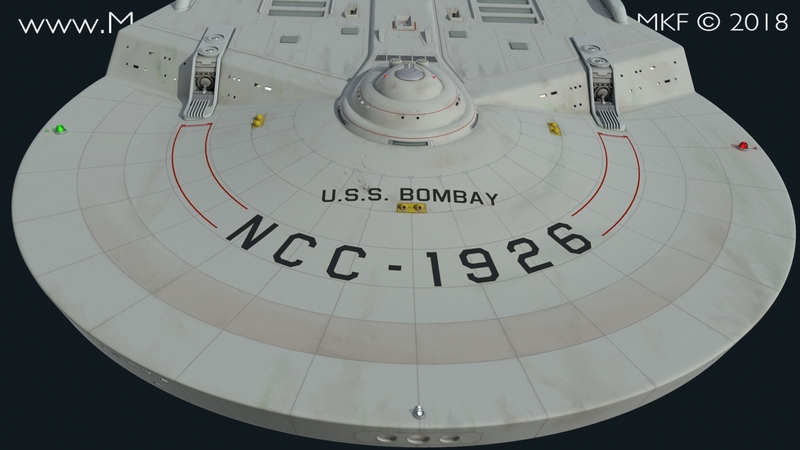 And yes the dock doors are mapped really large so I can do any lettering etc on them. Have to jab myself in the eye. . . . Almost done I think with this part. 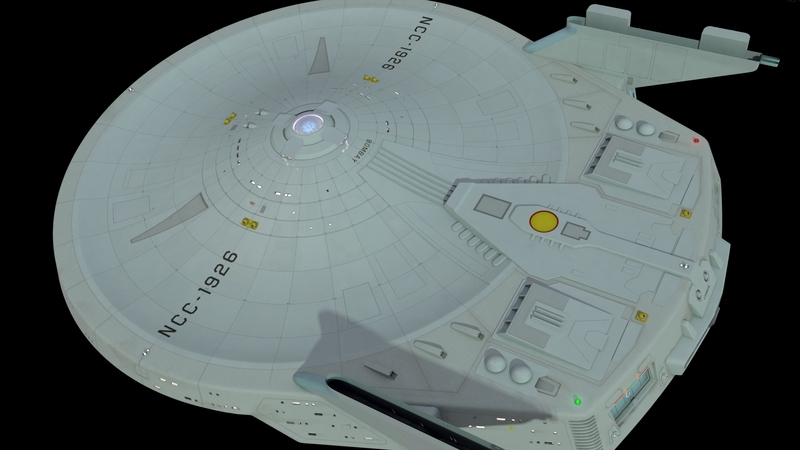 So uh, lower saucer struts and nacelles to go. . . . Debating on the lower saucer if I will just planar map that thing for ease of grime detailing. Heck I am a bit scared to say a lot of the work of today and yesterday might get tossed for a simple exploded planar map of the saucer top. 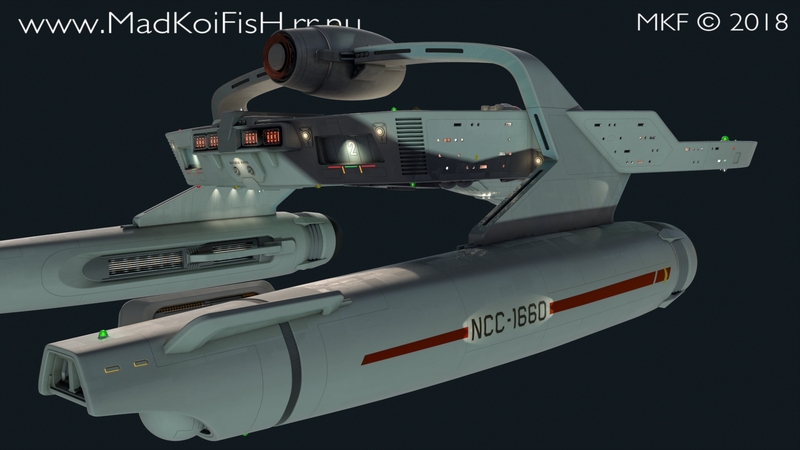 I do not look forward to painting that join of the struts to the hull. I probably should have cut myself a cheat stencil into the flat hull there. HAH. Matching that top hull to the sides looks like a world of pain too. Once all that is done it will be the fun of packing all this into a field for a painting stencil. ATM everything wants to be a long narrow strip the widest being the ships belt line. (note atm the sides and back side are overlapped so they produce a mirror effect. This is not to cheat on mapping but to align crap so I know it is the same from one side to another. Max AGAIN lacks tools for simple crap to avoid replicating work. 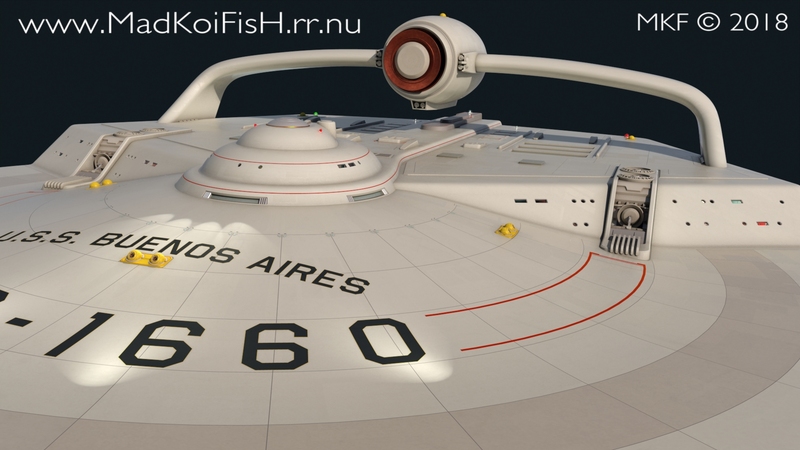 The model looks great MKF! Ooooooh I HATE UVW Unwrap! It never works for me. Ok I had planned to take a break and welp nah, didnt happen so this is where it is now mostly spent time unwraping those dart things. They are acually properly peeled so the polies are completely flat. Not that they matter that much as they are mostly going to be well dart things that are not that large. . . . . lol. Anyhow I re imaged the top part and at a stage of debate as I will no matter what end up with a seam somewhere. The thing is should I try to unpeel the rounded rim to the walls or the top and should I bother? The seam wont be seen unless i paint over it. I do have to say some battle damage I have planned will cross over this area on one side I think. now sure if it will reach that high, maybe some scorching. 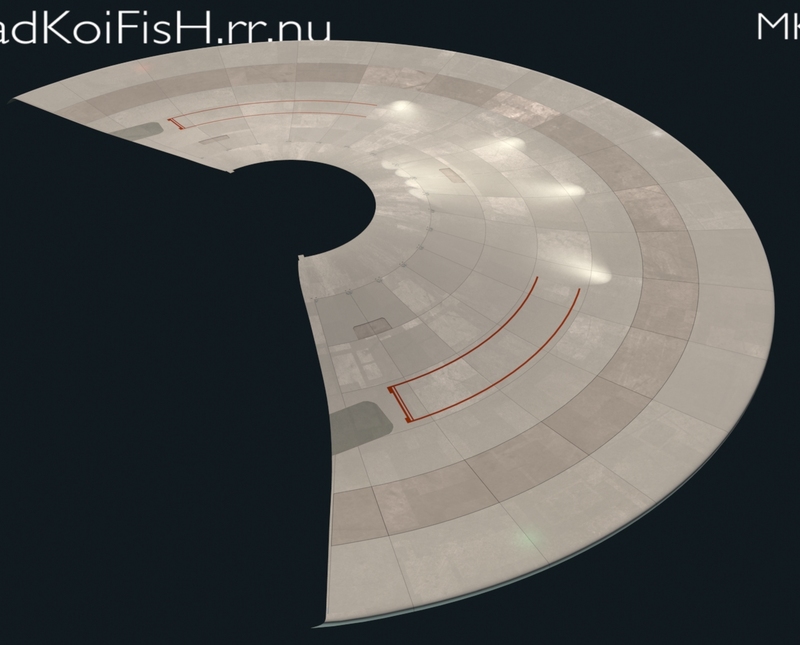 If I do not flatten and repatch that area it will have some stretching going on as seen in the render. Then again it could have some stretching no matter what as the hull is not square there so I will have to fudge the bits. Bah I will likely do it in the end pah. Oh to note I had to break the walls where the strut blocks it as I had the narrow down the width of the packing. MAX demands things fit in that square so it was tiny panels on a small corner of the square or break the unwrap and move those bits around. well got those edges flattened out and started painting filth on. The technique I'm thinking of using is making separate UV maps for doing decals and grid lines, and then another for doing the grime, then using the surface baking camera to make them into one. max can do similar with the composite shader, without rendering to texture/baking. LW might be different (assuming this is your app) I hope LW has better unwrap tools than max though heh. I tend to do as much outside the app and with as few as possible steps in other apps so if I need to make a change I am not going through a process of steps to alter something. It is part of the reason I am avoiding using material IDs on the UVWs as I have to collapse previous work to apply new work. Least it is this way in max. And max 2013, as it might have improved over time as max is now on this abandon ware track of forcing new purchases/rental every year to get bug fixes and updates. As for your planned method see if LW can do composite shaders IE a layer system in the diffuse slot then you can mix your maps. 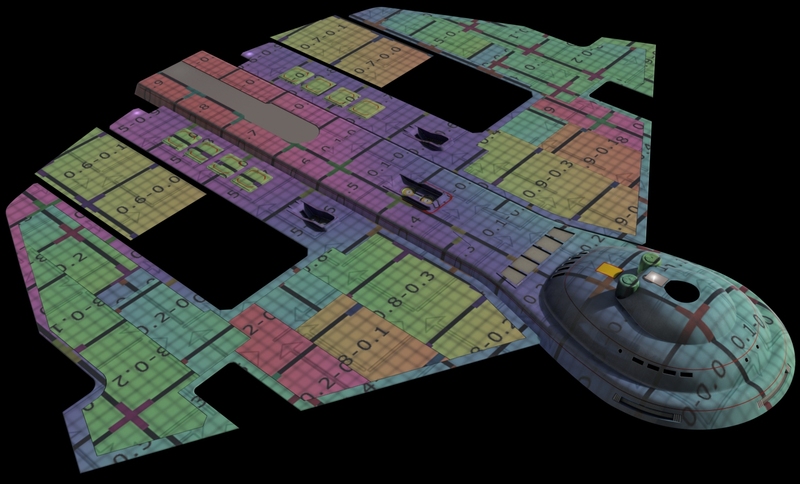 This would have been a option for me if the ship was a simpler UNWRAP and I could use multiple material IDs to separate out the projected or unwraped uvws. Then it leave the process open ended and editable without any rendering our outputting of final un-editable maps. It does mean a heavier texture load on render though but that is if your on a limited system ram <8gigs and using fat maps like I am 9k as I need to match print standards at 1/4 ship display @8k. Also mentioned UVW if you alter the mesh at all all unwrap work is lost in the stack. That post mostly was a comment about how I unwraped the mapping. I was too focused on my surfacing work vs the work I would be adding to my diffuse painting. In Lightwave you can layer multiple textures with blending styles similar to Photoshop. You can also create multiple UV maps for the same geometry with different unwraps so it's possible to do, though I haven't really checked how it looks yet. 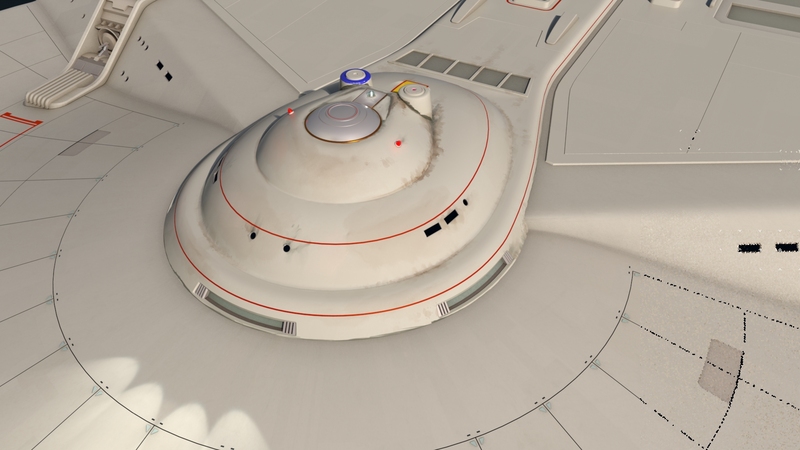 But that was my thought; you could do one straight unwrap of the saucer as one piece and apply the grime directly using that, then create another UV unwrap that is more suitable for aztecing. And no, the LW unwrap tools aren't much cop either. If I can't get a satisfactory unwrap with the automatic tools, I just create a new endomorph and flatten the mesh out myself. This is sometimes the only way to apply decals to some surfaces without them looking warped. yeah the mat IDs just complicate and finalize the unwrap so if I have to change something I am stuck. I would have to revert and import a old save so for now it is easier to either unwrap for one or the other. I have yet to decide though if I want to do anything like proper aztec or not. Likely I will do a simple patterning on the gloss slot and anisos slots to vary each individual panel so the reflective nature is different per panel. In max the layer shader is composite and it really needs some UI updates like a preview so you can see how each adjustment affects the composite. ATM you only have the full material sample which in max rarely is representative of what your rendered material would appear as.